DANVILLE, Va. - The Danville Braves will be offering specialty packages for the 2018 holiday season, which will last through December 19 by calling the Danville Braves front office. For $45, fans can purchase a D-Braves blanket ticket package that includes two blue reserved seats on opening day (June 18) and on the July 3 game, a D-Braves blanket (navy or gray) and $10 in Braves bucks. The ticket package is valued at $72. Fans can also purchase a Thirsty Thursday ticket package for $40. The deal includes a blue reserved seat at each of the D-Braves five home Thursday games, where the Braves offer discounts on draft and fountain beverages. The package also includes a knit cap, and in total it is valued at over $60 while supplies last. 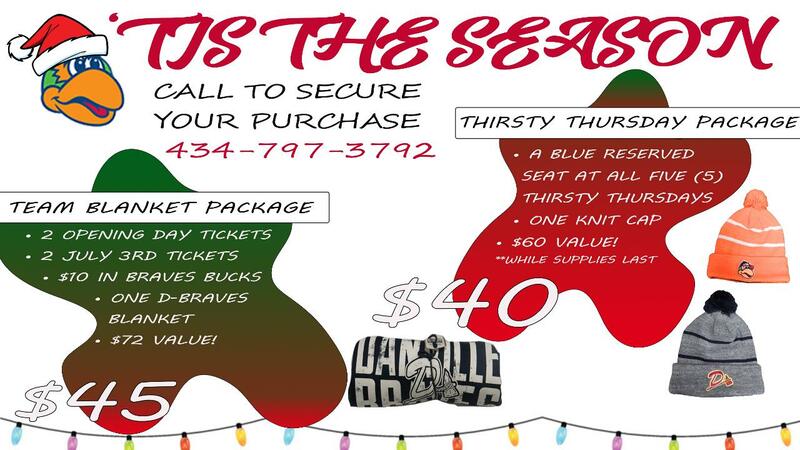 To secure your D-Braves Christmas package, call 434.797.3792 to talk with a front office representative.